Ohhh, congratulations, Peggy! Can't wait to see your wedding pix! Nice choice of recipe...the barbecue chili w/ corn is so simple to prepare but is really good! Geesh! You're gone for a month and you come back married? Guess it's time to change the name of the blog (: Congratulations! Great SRC pick too. Congratulations Peggy! you have to change the name of your blog. You sure have been a busy lady. Welcome back to our foodie world. Congratulations on your wedding! 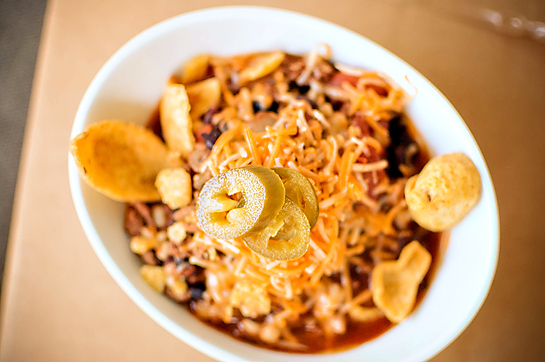 Love this chili - good chili is a fabulous thing to have in your recipe arsenal. The idea of crunchy corn kernels in my chili does sound like a tasty addition. It looks delicious. Also, you probably will be cooking more now that you are married! Enjoy the day! Congrats Peggy, Wishing a Happy married life. Love this chili. CONGRATULATIONS, Peggy...I'm anticipating a name change to your blog (again!) :) Your SRC post is amazing as always...what a delicious chili recipe! Congratulations Peggy. That is so amazing. I wish you a lifetime of happiness together. Great choice for SRC. I love chili so this is right up my alley. I can not imagine the hecticity (I know it is not a word but you get what I am saying!) of the month! Derby is a big deal I guess, I have never been to one. I bet this is one good chili. I would make it if it was not already climbing up to 90s here. Will have to wait for a cold rainy day! Congrats to both of you Peggy and Vegas must have been splendid. When I see chillies, I will all the way go for the recipes and yes, I love the chillies and cumin inside this wonderful bowl of food. Having said that, I need to replace the beef with other types of meat. Conratulations !! wish you all the best and happy life together,the chili sound really YUM,,shreedded habanero chedar cheese is combo on this chili !! First of all, congratulations on the wedding! I've been following some of your plans from afar and am so happy that you are so happy! Derby... I miss derby! We lived in Louisville for 3 years and Thunder of Lousiville was a favorite for us, as were the Derby parties. Here in San Diego they show the Derby, but no one even knows that there are other races that day. It's just not the same. And as for your recipe... fabulous!! Love the ingredients in this chili and i know I'd have one happy husband if he came home to this. Funny... he flies for UPS and is actually currently in the air and on his way to Louisville! Congratulations! Vegas must have been so much fun! This looks great, a nice bit of chilli would go down a treat.